In this image made from video provided by Korea Broadcasting System (KBS), South Korean President Moon Jae-in, left, and North Korean leader Kim Jong Un pose after signing documents in Pyongyang, North Korea, Sept. 19, 2018. The leaders of North and South Korea Wednesday hailed a series of agreements they said were aimed at turning the Koreas into a “land of peace without nuclear weapons and nuclear threats.” North Korean leader Kim Jong Un and South Korea’s Moon Jae-in Wednesday issued the pledge at a summit in the North’s capital, Pyongyang. The announcement prompted U.S. Secretary of State Mike Pompeo to invite North Korean Foreign Minister Ri Yong Ho to meet in New York next week, where both are scheduled to attend the United Nations General Assembly. Pompeo said the United States is ready to engage in talks with North Korea immediately, with the aim of completing Pyongyang’s denuclearization by the end of President Donald Trump’s first term. 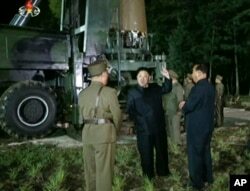 FILE - In this image made from video by North Korea's KRT, July 28, 2017, North Korean leader Kim Jong Un gestures at the site of a missile test at an undisclosed location in North Korea. Kim’s decision to dismantle its key missile site at Dongchang-ri in the presence of international observers is what Pompeo said prompted his decision to make the invitation. “On the basis of these important commitments, the United States is prepared to engage immediately in negotiations to transform U.S.-DPRK relations,” Pompeo said in a statement. “We, as the Ministry of Foreign Affairs, think that it will be able to accelerate denuclearization and bring peace on the Korean Peninsula through the U.N. General Assembly next week,” said ministry Special Representative for Korean Peninsula Peace and Security Affairs Lee Do-hoon, who added that the development may lead to a second summit between the United States and North Korea. “While this (the outcome of the third inter-Korean summit) may look small ... our role is to hand over (the conversation) to the U.S.,” Lee said. Pyongyang drew an enthusiastic response from Trump, who tweeted the news coming out of the third inter-Korean summit, saying it was “very exciting!” even though some analysts point out that specific details remain absent and a path to denuclearization is not clear. Even though it was not specified in the agreement signed Wednesday between Moon and Kim, the Sejong Institute’s Woo Jung-yeop assumes North Korea means they’re looking for a declaration from Washington to formally end the Korean War. “So it is apparent that North Korea is willing to exchange [a] declaration to end the war [in exchange for] the demolition of the Yongbyong facility,” said Woo. The Council of Foreign Relations’ Scott Snyder said an end-of-war declaration in exchange for a declaration of North Korean assets appears to be under consideration. Ajou University professor Kim Heung-kyu notes a balance of trust needs to be established between each party, otherwise it’s difficult to proceed with negotiations. 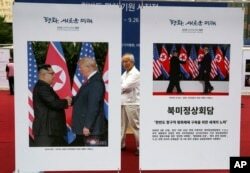 Photos of the summit between U.S. President Donald Trump and North Korean leader Kim Jong Un are displayed during a photo exhibition to wish for peace on the Korean Peninsula in Seoul, South Korea, Sept. 19, 2018. Moon said North Korean leader Kim Jong Un wants to hold a second summit with President Trump to hasten the process of denuclearizing the Korean peninsula. He revealed Kim’s wishes Thursday in Seoul, after his return from his visit to Pyongyang. Harry Kazianis, director of defense studies at the Center for the National Interest, believes the possibility of a second Trump-Kim summit is “100 percent,” adding it could also be a trilateral summit with Moon, or even a quadrilateral meeting with Chinese President Xi Jinping, because Moon hasn’t revealed everything regarding Kim’s plans to denuclearize. “I think [Moon] understands that he needs to hold some things close to the chest to be able to bring to Donald Trump, maybe additional concessions. ... Maybe Kim Jong Un made some other proposals that we don’t know about today, and that makes sense,” said Kazianis.